. Published on Wednesday, October 11, 2017 . If you’ve never tried your hand at an escape room before, this Halloween season is the perfect time to do so. The objective of escape rooms is simple: you and your friends are placed in a locked room and the only way to get out is by working together as a team to solve puzzles, unlock doors and discover the correct codes to break out in the allotted time. Here are some of the best escape rooms in the area. Your grandmother has mysteriously disappeared, and she has a hidden inheritance. All she left you is a peculiar letter that revealed surprising news: she was one of the world’s most famous bank robbers. The letter prompts you to carry out her final wish, to rob the bank she never got the chance to. In this unique escape room, you are cast in an eerie horror film as a stereotypical horror film cliché. Based on your role, you are locked in your own mini-escape room. That’s right, you must first escape individually before escaping (and surviving the film) as a group. This room’s attention to detail and the immersive plot makes for an escape experience unlike any other. If you are new to the world of escape rooms, this room is perfect for you. In the same building as the frightening Hex Room is the vibrant Fun House. This moderately difficult room is carnival themed, and its whimsical, topsy-turvy details are sure to keep you on your toes. Find out if you are a mighty magician or a clueless clown and try to escape this one! After being sentenced to a lifetime in prison, the security guards have left to tend to a local riot. You have 60 minutes to escape with your cell-mates before the guards get back. Using what you have in your cell, you must bust out of prison. You are aboard the RMS Titanic when it starts to sink. You and your crew are responsible for rescuing the ship. This compelling escape room will have you captivated and determined to stop the ship from sinking. The urgency of this room will have you feeling like you’re in a real-life situation—and you only have 60 minutes to save the ship. 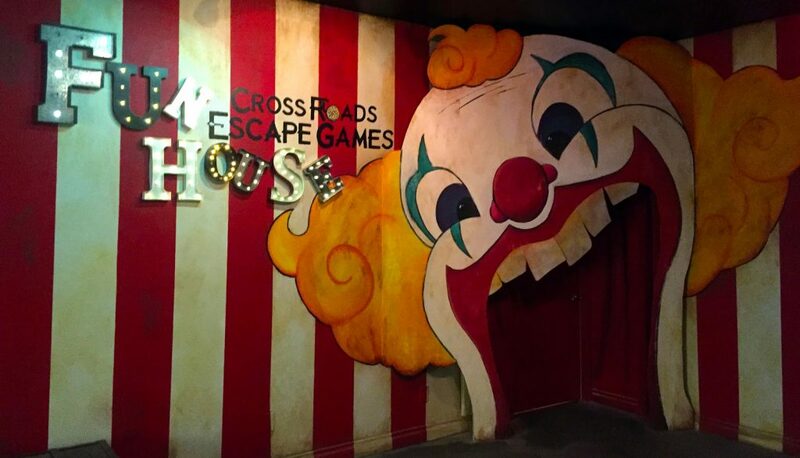 If you’re in the market to get the heeby-jeebies from an escape room, the Daycare room at Escape Hotel is exactly what you’re looking for. The plot in this one is thick: all the little girls in daycare room 1919 have either gone missing or were found dead. It is your job to figure out the truth behind this mystery. If you can’t uncover the truth and bring the curse to a halt, your fate will be the same as all the children in the daycare before you. The Central Bank escape room is located in the same building as Prison Break. Unlike most escape rooms, the object of this room is not to escape, but to steal as much as you can from the Central Bank. In complete darkness, you and your fellow thieves must illuminate the room with flashlights to complete your diamond heist in under one hour. Which escape room are you itching to try? Let us know by using the hashtag #CampusCropChat on Facebook, Instagram and Twitter. Don’t forget to follow us on Snapchat @ASICPP!